Many masters say the Ho’oponopono is intimately related to the standpoint of Holism. The holistic perspective is applied by certain schools of thought in disciplines like Psychology, Theology, Anthropology, Philosophy, Sociology and Medicine. Holism states that every single thing or being that exists in the Universe is interconnected with all the rest. A quite recent but very well-known discipline called Quantum Physics confirmed this principle too. Likewise, Metaphysics asserted this viewpoint for many centuries. It is important to know that the holistic standpoint is also related to the systemic perspective. In any system, all its factors are closely interrelated; they are continually affecting one another. Besides this, each system has a function and each of the components has particular functions which contribute to the overall function of the system. The behavior of any system is generally unpredictable. Statistical science knows this and takes into account error margins in the estimation of the systems’ activities. The comportment of a system cannot be estimated with extreme precision because of the multiple relationships among its components. From this perspective, the whole (or system) cannot be explained throughout any of its components (or parts). When you focus on only a part of the whole, the knowledge about that part will be partial. To thoroughly understand any factor of the system you have to take into account the wholeness this factor belongs to. You can apply this systemic approach to your body and its organs. Societies can also be considered as systems. The same perspective can be applied to nature and its phenomena and elements. The market itself is a system where there exist producers, consumers, government and other agents. Cultures are systems which have specific factors, such as verbal and non-verbal language, customs, food, dance, history and others, which are closely related to one another. Organizations are also systems which have internal structures (departments, sections or divisions) which vary according the organization analyzed. Organizations, in turn, belong to bigger systems as associations, confederations, sectors, etc. The Universe can also be considered as a big system itself, with different (countless) components. Everything that exists can be considered as part of an overarching and complex system, the Universe. Besides, the Universe itself is a set of self-contained systems. You, as an individual, can also be considered as a system. You, as a human being, are a system which is made up of several subsystems. These subsystems are your organs which are made up of cells. These cells are composed of molecules; molecules are made up of atoms. You are a set of self-contained systems. From the medical perspective, mind and body work in a coordinated manner, as part of an integral system. Medically speaking you can also recognize many systems in your body, such as the respiratory system, nervous system, endocrine system, circulatory system, digestive system, among others. Your mind can also be considered a system, composed of three subsystems: your super conscious mind, your conscious mind and your subconscious mind. You as an individual belong to bigger systems, such as your family, your work team and your friends groups. Other systems you belong to are your local community, your country, the world and the Universe. All the components of the systems you belong to are affecting you and vice versa. The same happens with all the subsystems within you. For this reason, you, as an individual, cannot be entirely analyzed without considering the environments (systems) where you operate and the subsystems you enclose. From the holistic viewpoint, you are linked to all that surrounds you and you also experience the state of sameness regarding all that exists. Regarding this, traditional Physics says that every single thing that exists is made up the same substance, which is energy. 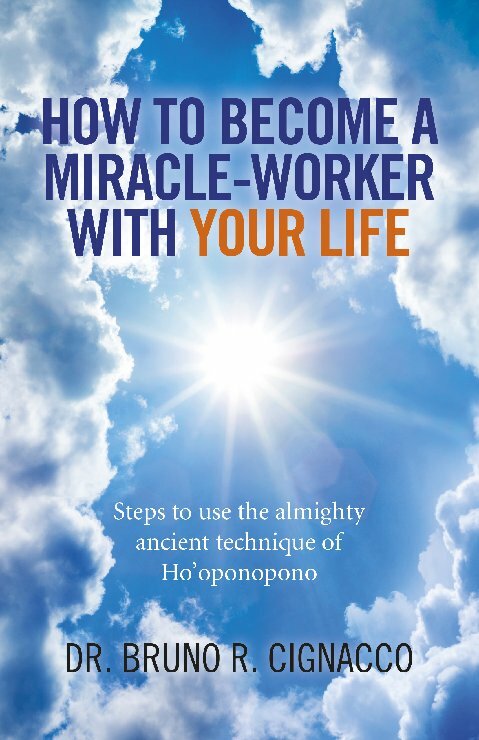 How to Become a Miracle-Worker with Your Life - Steps to use the almighty ancient technique of Ho'oponopono by Bruno Cignacco is published by O Books November 2015. ISBN: 978-1-78535-121-1 (Paperback) £18.99 $30.95, EISBN: 978-1-78535-122-8 (e-book) £6.99 $9.99.